As the pronounced mating season behaviors of companion birds are in full swing, you read a lot about the struggles people are experiencing on the array of bird forums across the web. From random aggression, territorial nesting, endless squawking, and other strange and sometimes obtrusive behaviors, it’s no wonder people are ready to grasp at any solution they can get their hands on. One such “solution” that I often see people exploring is the idea of finding their bird a mate. Many people pose the question, If I get a female for my hormonally-driven male, will that make him happy? Will that put an end to my mating season strife? It sounds simple enough – my bird is acting like a maniac because it wants to mate, I get him a mate, and voila! No more maniac! Ahhh, if only. I, too, fell into the similar fairy tale thinking when Paz and Pepe began to show interest in each other through their shared wall. How perfect it would be to bond them as a pair so they can provide companionship to each other! When they became insistent about trying to be together and Paz wouldn’t stop croaking, we embraced the opportunity to socialize them and after proving their ability to cohabitate, we took down the wall in between them and expanded their aviary. It had never been our goal to breed them and I naively figured that it was unlikely that they actually would. I adopted the laissez-faire attitude of “whatever makes them happy” and we all were – for a short while. But in reality, the so-called “simple solution” of providing your bird with a mate is actually the farthest thing from simple. To begin with, breeding birds is a highly specialized occupation that is not something easily dappled in by the average pet bird owner. There are seemingly endless issues to consider: Will you allow your birds to keep their eggs or do you plan to incubate them yourself? Do you have the right size enclosure and nest for your birds? Should you change their diet to provide the female with the nutrition she may need while laying eggs? Seriously – you could fill a book with all of the information you need to know about breeding birds, and an even longer one for the more difficult toucans, (and I wish someone would – ahem…Jerry Jennings… 😉 ) and you still would feel overwhelmed simply due to your inexperience. Trust me – been there, doing that. And make no doubt about it, as we witnessed firsthand with Paz and Pepe (see: Our First Egg Adventure), if you put a pair of birds together during mating season, they will, in fact, mate. It’s okay, don’t be embarrassed, this came as a bit of a surprise to me too. Don’t get me wrong, there were many positives to Paz and Pepe’s pairing. It was obvious that they both enjoyed the companionship and the shared mission of procreation. It was both adorable and an incredible education to watch them interact with one another. But there were definitely a lot of things that changed due to their transition into a breeding pair, rather than two individual pet birds, that created quite a few predicaments for us. To be expected, they became much less interested in us and showed little desire, especially in the beginning, to participate in any training and/or bonding activity. While this is obviously not the end of the world and some would say, a worthy trade-off, it is quite a bummer when you have your two pets that have bonded with you, suddenly not wishing to engage with you as much. Most breeders will tell you to leave a breeding pair completely to themselves with no human interruptions. But ours still seemed to crave some interaction, as most people’s pets would – they weren’t raised as wild breeder birds and I think it would have been awful for them to turn them into that. But it was hard to say whether our interaction, which they seemed to desire, was making things easier or more difficult on them, from a breeding perspective. We ultimately determined that sticking to our main goal of “whatever makes them happiest” meant that we would continue our involvement in their lives, feeling it would be cruel to end all contact. The random aggression has also been a challenge – having a baby (ok, eggs) changes everything. Pepe, our most easy-going toucan, who’s always loved to give kisses and play games suddenly had moments of surprise aggression whenever there were eggs in the nest. I say surprise because I could tell it even caught him off guard, as though he felt almost out of control of his emotions. He would suddenly go to bite me and then stop midway as though the shock of it all just hit him – I don’t know if he felt like he wanted to bite me but knew he shouldn’t or if he didn’t want to bite me but felt like he should – either way, the internal conflict was written all over his face. By the end of Clutch #2, Paz was starting to look worse for wear. She has always been our most strikingly beautiful toucan due to her larger size and extra-fluffy plumage, but now, she looks like she’s been through the ringer. She has been going through a normal molt and her feathers aren’t coming in as fast as you’d hope for, but what has really taken the toll on her body is all of the extended time spent in the nest. Her heel pads have become swollen and cracked from all of the sitting and she has broken many of her tail and wing feathers going in, out, and about in the nest log. The lack of full feathers has hurt her mobility, making it more difficult for her to make the vertical hops and short flights. After the progressive loss of the eggs in their 3rd clutch, things got a bit more volatile in Toucanland. Pepe was ready to try, try again, yet Paz seemed to have decided she had had enough. As Pepe continued to court her, she began to avoid him, much to his confusion. The once sweet courtship dance of feeding Paz his favorite treats and toys quickly turned into a chase, one that would occasionally become aggressive as he tried in desperation to force his “gifts” upon her. As the days went on, Pepe’s frustration grew and we found ourselves having to intervene on a few occasions to protect Paz. While Paz is typically the larger and stronger of the two, all of her broken wing feathers had given Pepe an uneven advantage, as she was no longer as agile flying about their shared enclosure. Pepe was now able to dominate her more easily and a couple of times, trapped her into a position she was unable to extricate herself from. It was really difficult to decide upon on our best course of action. For the most part, they were going about business as usual and seemed to be getting along fine. But the sporadic events when Pepe would become almost overwhelmed with aggression towards Paz, leading us to intervene due to her inability to escape him, were worrisome for us, as we were not able to be present 24 hours a day. So, I sent out a cry for help to my expert toucan resources, hoping to gain some clarity on the best route to take. The one thing I would suggest if you ever attempt to have a breeding pair of birds is to rally yourself up some experts. If you’re like me, you will have an endless stream of concerns and general questions that cannot be found simply on the all-knowing Google. Having multiple resources that you respect and trust is invaluable and will provide you with insight and comfort that you will not be able to find elsewhere. In this case, all of the toucan breeding experts were in agreement that Paz was being mistreated and was potentially in grave danger. The verdict was in: they needed to be separated. Ultimately, no matter how much expert advice you can get, only you know your own birds and can truly assess the situation firsthand. For us, while we didn’t think Pepe had it in him to actually seriously maim her, we could see that Paz needed a recovery break and a chance to rebuild her resources to maintain her own safety. Otherwise, in her semi-exhausted state, she could injure herself in her escape attempts of Pepe. So, as much of a disappointment as it was to have to do, we divided the aviary once more with a temporary canvas wall. Paz’s visible relief was immediate and she seemed to revel in the time to herself – taking long baths, playing with her toys, and eating peacefully without the pressure of having Pepe chasing after her. Pepe, on the other hand, had a difficult time with the separation. It was heartbreaking for me, as he wanted little to do with us, or anything for that matter,by way of comfort other than sit by the wall, trying to get to Paz, and croaking to express his displeasure. It has now been almost a week since their separation and Paz has perked up, both behaviorally and in physical appearance. Pepe has settled down, but has not given up on his watch for Paz. For the first time yesterday, she expressed interest in him, trying to get to him through their shared wall, and thereby giving us more tough decisions to contemplate. While we had initially figured that we would need to keep them apart until the end of breeding season (whenever that may be) and everyone’s hormones had settled, now we’re unsure. Because they are a bonded pair, it seems cruel to keep them apart. But at the same time, it is hard to imagine Paz’s body going through the stress of another clutch, especially before she has had enough time to allow her feathers to fill in. For now, all we can do is take things day by day, keeping a close eye on the pair and feeling out the situation. In a perfect world, it would probably be best to keep them apart for the duration of mating season and until both of them have finished molting and have all of their feathers in. But nothing is ever simple with breeding birds, nor is anything simple with toucans. – The Love Birds Part Deux: Paz & Pepe are Shackin’ Up! 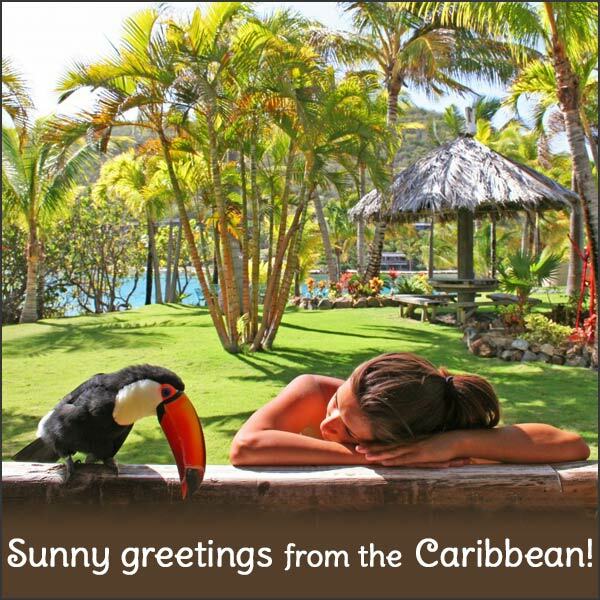 This entry was posted in Care and tagged Adventures in Toucanland, bird, bird breeding, birds, breeding, BVI, Caribbean birds, exotic birds, exotic pets, island, mating, mating season, mating toucans, Paco, Paz, Pepe, pet, pet bird, pet birds, pets, Toco, Toco Toucan, Tocos, Toucan, toucan breeding, toucan pair, toucanland, toucans, tropical birds, tucan, tucans by Toucan Lady. Bookmark the permalink.